Not to be confused with Red Hat Linux or Red Hat Enterprise Linux. 2003-11-16 It was codenamedYarrow. Fedora Core 1 was based on Red Hat Linux 9 and shipped with version 2.4.19 of the Linux kernel, version 2.4 of the GNOME desktop environment, and K Desktop Environment 3.1. Fedora ( /fɨˈdɒr.ə/), formerly Fedora Core, is an RPM-based, general purpose collection of software, including an operating systembased on the Linux kernel, developed by the community-supported Fedora Project and owned by Red Hat. The Fedora Project’s mission is to lead the advancement of free and open source software and content as a collaborative community. One of Fedora’s main objectives is not only to contain software distributed under a free and open source license, but also to be on the leading edge of such technologies. Fedora developers prefer to make upstream changes instead of applying fixes specifically for Fedora—this ensures that their updates are available to all Linux distributions. A version of Fedora has a relatively short life cycle—the maintenance period is only 13 months: there are 6 months between releases, and version X is supported only until 1 month after version X+2. This promotes leading-edge software because it frees developers from some backward compatibility restraints, but it also makes Fedora a poor choice for product development (e.g., embedded systems), which usually requires long-term vendor-support, unavailable with any version of Fedora. In 2008, Linus Torvalds, author of the Linux kernel, stated that he used Fedora because it had fairly good support for the PowerPCprocessor architecture, which he had favoured at the time. According to DistroWatch, Fedora is the third most visited Linux-based operating system on their site as of May 2012, behind Mint andUbuntu, and it is the most visited RPM-based Linux distribution. The Fedora Project was created in late 2003, when Red Hat Linux was discontinued. Red Hat Enterprise Linux was to be Red Hat’s only officially supported Linux distribution, while Fedora was to be a community distribution. Red Hat Enterprise Linux branches its releases from versions of Fedora. The name of Fedora derives from Fedora Linux, a volunteer project that provided extra software for the Red Hat Linux distribution, and from the characteristic fedora used in Red Hat’s “Shadowman” logo. Warren Togami began Fedora Linux in 2002 as an undergraduate project, intended to provide a single repository for well-tested third-party software packages so that non-Red Hat software would be easier to find, develop, and use. The key difference between the approaches of Fedora Linux and Red Hat Linux was that Fedora’s repository development would be collaborative with the global volunteer community. Fedora Linux was eventually absorbed into the Fedora Project, carrying with it this collaborative approach. Fedora is a trademark of Red Hat, and although this had previously been disputed by the creators of the unrelated Fedora repository management software, the issue has now been resolved. The Fedora Project is governed by a board whose majority is elected by the Fedora community. Minimal CD – used for installing over HTTP, FTP or NFS. The Fedora Project also distributes custom variations of Fedora which are called Fedora spins. These are built from a specific set of software packages and have a combination of software to meet the requirements of a specific kind of end user. Fedora spins are developed by several Fedora special interest groups. It is also possible to create Live USB versions of Fedora using Fedora Live USB creator, UNetbootin or dd. Extra Packages for Enterprise Linux (EPEL) is a volunteer-based community effort from the Fedora project to create a repository of high-quality add-on packages that complement the Fedora-based Red Hat Enterprise Linux and its compatible spinoffs such as CentOS or Scientific Linux. Software package management is primarily handled by the yum utility. Graphical interfaces, such as pirut and pup are provided, as well as puplet, which provides visual notifications in the panel when updates are available. apt-rpm is an alternative to yum, and may be more familiar to people used to Debian or Debian-based distributions, where Advanced Packaging Tool is used to manage packages. Additionally, extra repositories can be added to the system, so that packages not available in Fedora can be installed. Fedora comes installed with a wide range of software that includes LibreOffice, Firefox, Empathy, Evolution and GIMP. Additional software that is not installed by default can be downloaded using the package manager. Before Fedora 7, there were two main repositories – Core and Extras. Fedora Core contained all the base packages that were required by the operating system, as well as other packages that were distributed along with the installation CD/DVDs, and was maintained only by Red Hat developers. 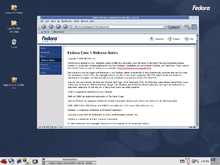 Fedora Extras, the secondary repository that was included from Fedora Core 3, was community-maintained and not distributed along with the installation CD/DVDs. Since Fedora 7, the Core and Extras repositories have been merged, hence the distribution dropping Core from its name. That also allowed for community submissions of packages that were formerly allowed only by Red Hat developers. Also prior to Fedora 7 being released, there was a third repository called Fedora Legacy. This repository was community-maintained and was mainly concerned with extending the life cycle of older Fedora Core distributions and selected Red Hat Linux releases that were no longer officially maintained. Fedora Legacy was shut down in December 2006. Third party repositories exist that distribute more packages that are not included in Fedora either because it does not meet Fedora’s definition of free software or because distribution of that software may violate US law. The primary third party repositories, and the only fully compatible ones, are RPM Fusion and Livna. RPM Fusion is a joint effort by many third party repository maintainers. Livna is still maintained separately as an extension of RPM Fusion for legal reasons and only hosts the libdvdcss package for encrypted DVD playback. 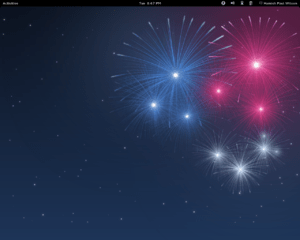 The default desktop in Fedora is the GNOME desktop environment, with Fedora offering the GNOME Shell as its default interface since the release of Fedora 15. Other desktop environments are available from the Fedora package repositories, and can also be installed from the Fedora installer, including the KDE Plasma Workspaces, Xfce, and LXDE desktop environments. In addition, specialized “spins” are available offering these alternative desktops custom configured and offered by default. Other spins are also available targeting specific niche interests, such as gaming, security, design, and robotics. Security is one of the most important features in Fedora. One of the security features in Fedora is Security-Enhanced Linux, a Linux feature that implements a variety of security policies, including mandatory access controls, through the use of Linux Security Modules (LSM) in the Linux kernel. Fedora is one of the distributions leading the way with SELinux. SELinux was introduced in Fedora Core 2. It was disabled by default, as it radically altered how the operating system worked, but was enabled by default in Fedora Core 3 and introduced a less strict, targeted policy. The current release of the operating system is Fedora 17, codenamed “Beefy Miracle”, which was released on May 29, 2012. Fedora released Fedora 18 alpha on 18 September 2012. The final release is currently predicted to be released on 2012-12-04.